Below is a photo of the Studio Walk which connects The Signature Condos to the MGM Grand Hotel, without having to leave the property. Across from the MGM Grand Hotel is the new T-Mobile Arena, THE PARK and The Park Theater, along with numerous eateries, The NY NY and Monte Carlo ( to be renamed) Hotels. Adjacent to The MGM Signature Condos is TOP GOLF LAS VEGAS. They have a shuttle that takes folks back and forth from the venue. To the North outside the gates is Planet Hollywood. City Center and The Aria And the Cosmo are about one long block west of the Signature Towers. The location is prime. Undoubtably, The Signature at MGM Grand Residences aka “MGM Signature Condos” are the most popular high rise condo towers for Buyers. This is due to the A+ location east of the Strip and Harmon Avenue, the guard gated entry, the fact that they are offered turn key furnished, connected via a walkway to The MGM Grand Hotel, and have the ability to be able to rented your condotel on a nightly basis by the on site management. People who are fans of AIRBNB can place their units on that website for rent, or avail themselves of other 3rd part rental programs such as Jet Luxury Resorts, which offers owners a 70% split of revenues.. There are 578 condos in each of the three towers for a total of 1734 units. These are 520 sq. ft studios and 1 bedrooms in 847 sq. ft plus corner 1 bedrooms in 874 square feet. All one bedroom units have balconies. If you scroll down the screen, you will see ALL OF THE MLS LISTINGS for MGM Signature condos. This link is a live feed that is updated throughout the day, but as of this writing, there is a total of JUST 15 available units in all 3 towers. This is fewer than 1% of the total number of units. Our team has been selling The Signature Condos since the preconstruction days. The inventory is thinner than it has ever been in the past decade. With the announcement of the new Raiders Stadium, Las Vegas Strip Condos are selling at a faster pace than last year, but these Signature units are the hottest commodity in Las Vegas Condos. Strong Buyer demand is putting upward pressure on prices and occupancy and revenues seem to be trending in that direction as well. The Stark Team is pleased to have just listed the only 1 bedroom/studio pair available in any of the three towers. 1 BR Strip Facing Corner Unit in PLUS Studio in Signature MGM creating a pair with adjacent studio 2203. 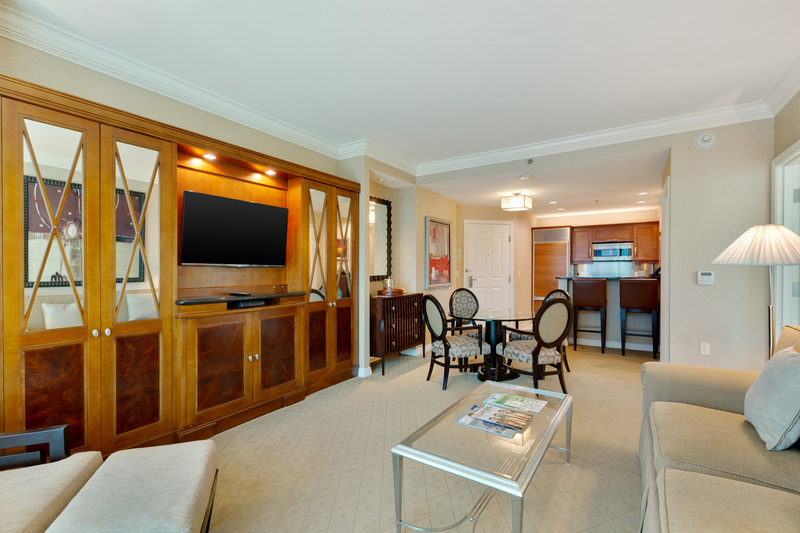 Fully Furnished to MGM Signature Rental Program Standards. Luxurious Master Bath. Amazing Strip Views! Enjoy all Signature MGM amenities including: fitness center, Starbucks, pool, cafe, business center. Walk everywhere! Rental statements are available for preview. CONTACT US & request them. This entry was posted in Condos Near The Stadium Site, Las Vegas Center Strip, Las Vegas Hotel Condos, MGM Condos and tagged las Vegas Condos, Las vegas hotel-condos for sale, MGM Signature Condos, The SIgnature Condos Las Vegas. Bookmark the permalink.